SkyCiv Cloud Structural Analysis Software – How to Draw Bending Moment Diagrams? Below are simple instructions on how to calculate the bending moment diagram of a simply supported beam. Study this method as it is very versatile (and can be adapted to many different types of problem. The ability to calculate the moment of a beam is very common practice for structural engineers and often comes up in college and high school exams. 1. 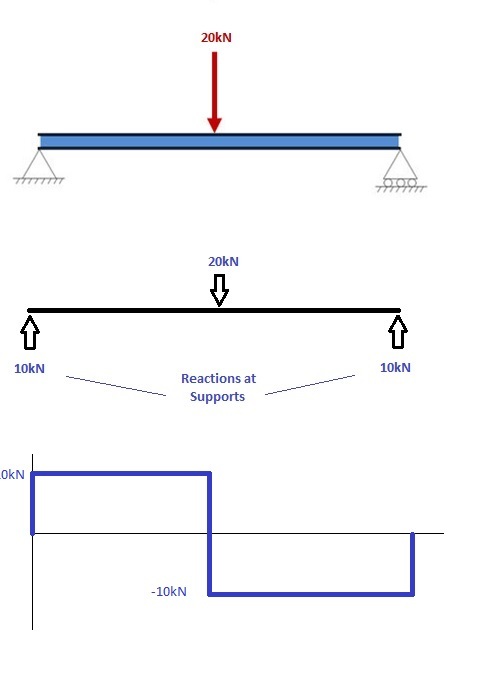 Calculate reactions at supports and draw Free Body Diagram (FBD). 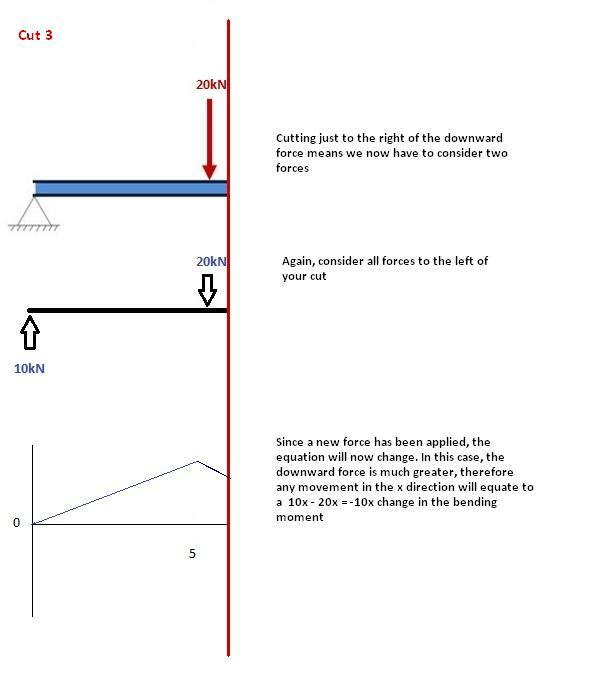 To calculate the bending moment of a beam, we must work in the same way we did for the Shear Force Diagram. 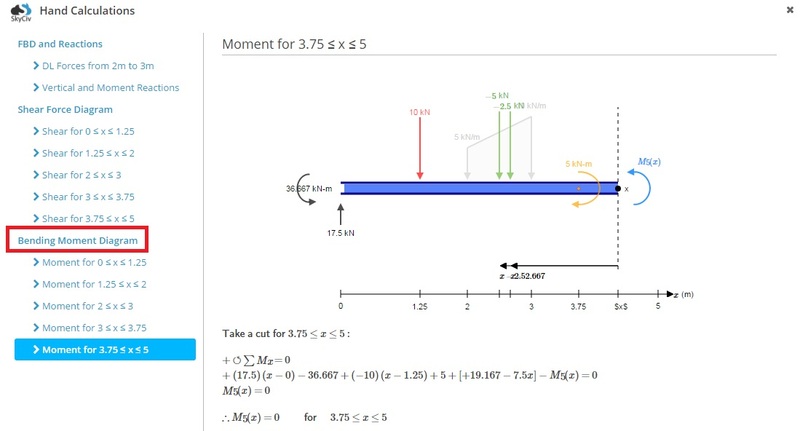 Starting at x = 0 we will move across the beam and calculate the bending moment at each point. 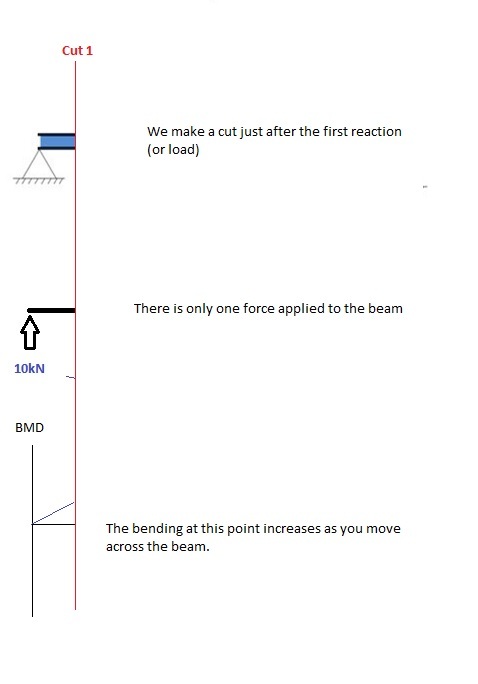 This cut is made just after the second force along the beam. Now we have TWO forces that act to the left of our cut: a 10kN support reaction and a -20kN downward acting load. So now we must consider both these forces as we progress along our beam. For every metre we move across the beam, there will a +10kNm moment added from the first force and -20kNm from the second. So after the point x=5, our Bending Moment Equation becomes: M(x) = 50 +10(x-5) – 20(x-5) M(x) = 50 -10(x-5) for 5 ≤ x ≤ 10 NOTE: The reason we write (x-5) is because we want to know the distance from the pt x=5 only. Anything before this point uses a previous equation. 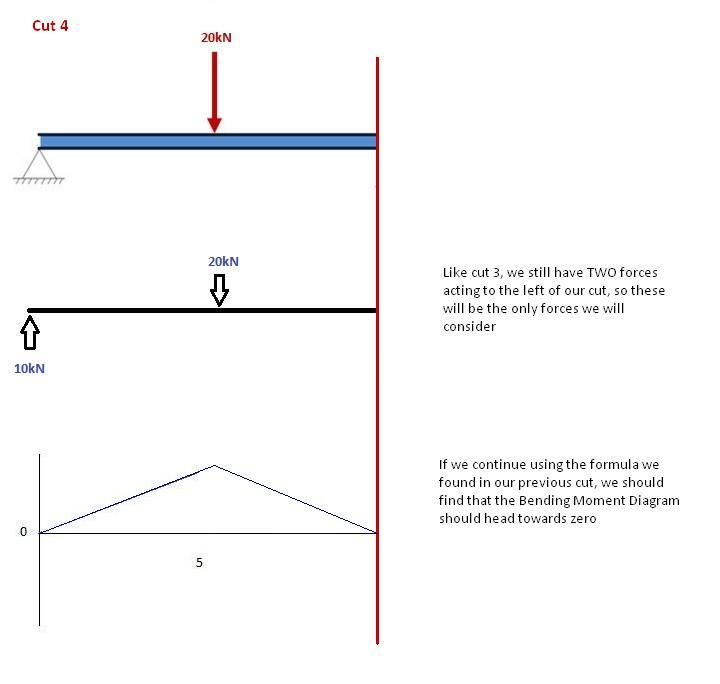 Again, let’s move across to the right of our beam and make a cut just before our next force. In this case, our next cut will occur just before the reaction from Right Support. Since there are no other forces between the support and our previous cut, the equation will remain the same: M(x) = 50 -10(x-5) for 5 ≤ x≤ 10 And let’s substitute x=10 into this to find the find bending moment at the end of the beam: M(x) = 50 – 10(10-5) = 0kNm This makes perfect sense. 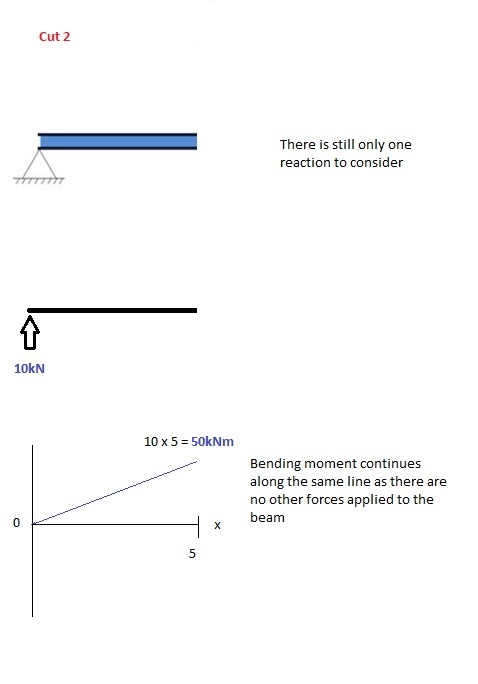 Since our beam is static (and not rotation) it makes sense that our beam should have zero moment at this point when we consider all our forces. It also satisfies one of our initial conditions, that the sum of moments at a support is equal to zero. NOTE: If your calculations lead you to any other number other than 0, you have made a mistake!